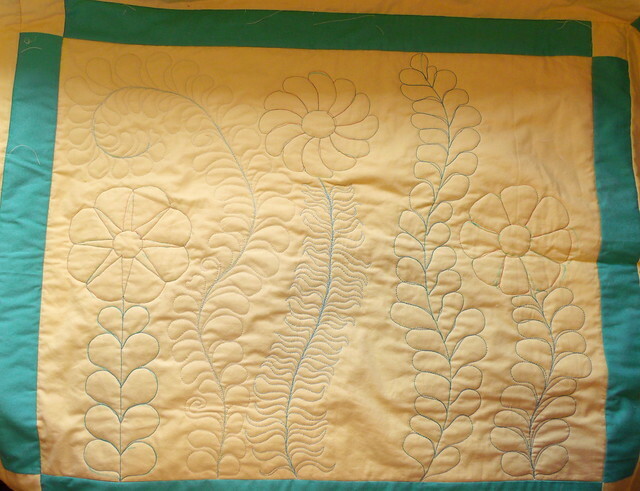 Just recently I signed up for another Craftsy class, Ann Petersen's Beyond Basic Machine Quilting. I really liked her teaching style in the other class of hers I took, and after I read Sandy's review of the class I made my mind up to give it a try. It's going pretty well. I'm in the midst of the class free motion quilting sampler project and things are improving rather than getting worse. I've just finished adding in the major elements, and the next lesson is on embellishing the quilting (with more quilting, that is, rather than embellishment with other stuff). I only just today got around to picking up some trilobal polyester thread, which is what's recommended in the course. I started out using random threads I had around that seemed strong enough to quilt with. My stitching improved immediately and dramatically after switching to to the trilobal polyester, particularly on the back of the piece, which was gratifying to see. The back looking terrible is something I've been struggling with. In the photo there's still a lot of blue water-soluble pen visible — though it's been so crazy humid that some of it has actually disappeared, even though it isn't one of those air-soluble ones. I also made the somewhat questionable stylistic decision to do my first few tries at feathers in a super bright teal thread — whee! On Thursday and Friday I was out of town for a short trip to Cincinnati. On the way there, Don and I stopped at a great little museum at the Clinton County Historical Society in Wilmington. We didn't get to spend tons of time there due to getting out of town later than expected, but we got to see the main things we were interested in. They have a great cabinet of curiosities exhibit right now, with all sorts of odd historical bits. They have a a couple Victorian hair wreaths, including a great big one that has hair from 97 different members of one family. Every little leaf and flower in it is numbered on the paper backing the piece, and their names are all listed along the sides. There was also an exceptionally creepy clockwork doll that was designed to crawl. There was a photography exhibit as well that was really neat, and a textile room full of cool stuff. I was so caught up with looking at everything that I didn't get any photos, unfortunately. I made a quick stop at the Cotton Junky quilt shop in Wilmington, too. 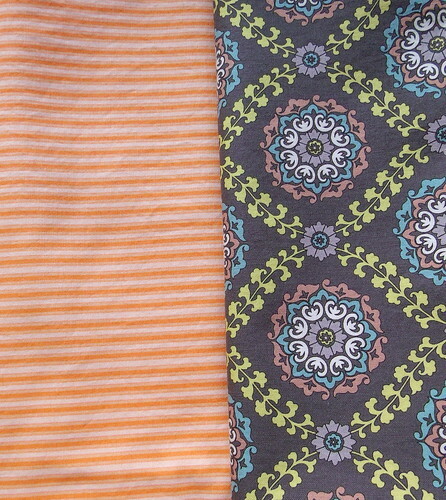 Road trip fabric is a totally legitimate thing, right? I thought so, too. Now I'm going to go watch that embellishment video. I'm really excited about working on this. Disclosure: Craftsy link is an affiliate link, which means I may be compensated if you make a purchase through that link. I only use affiliate links for services/products I actually use myself.